Yes, it's been 2 years since I started my blog where my passion for cooking meets the culinary journey of experiencing and experimenting different cuisines in my kitchen. I thank all my wonderful readers for the awe inspiring comments and regular visits. Hope you will hang in there with me at times when I am inconsistent in posting recipes. I am really surprised at myself that I have it for 2 years. Baking something sweet was more apt to celebrate the 3 special occasions. I am also happy to announce that this is my 100th post, a milestone to celebrate along with the blog anniversary. Last week was Nathan's birthday too. His only demand was to bake a chocoholic cake. Luckily it all worked out well and I got a recipe to post for my blog anniversary and 100th post. I had a family and friends gathering on his birthday, so I made sure to bake the cake couple of days ago. On his birthday, I frosted the cake with chocolate butter cream frosting, which I thought was better than the regular butter cream frosting. I am not a huge fan of butter cream frosting, but I thought to make it for him as he wanted a sweet chocolate frosting. As usual, I didn't like my cake styling when done is hurry. But I had to click few snaps here and there. 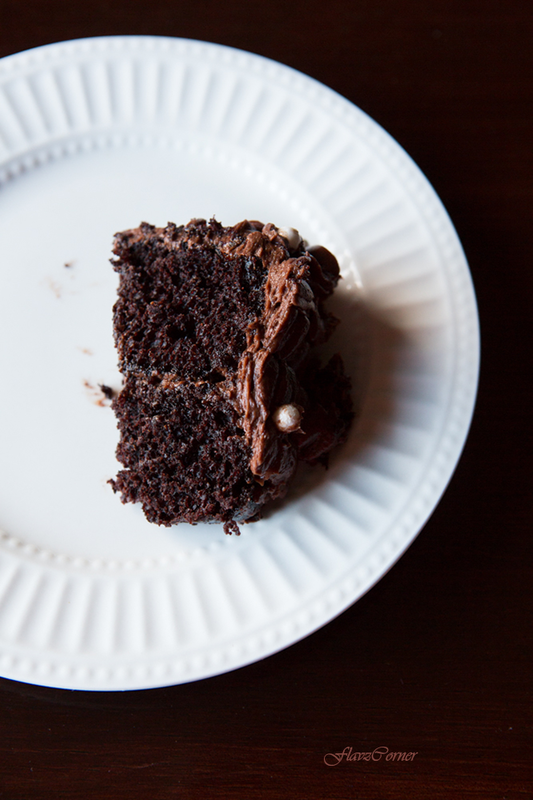 The best part of this cake was the dark, soft, moist chocolate cake which is not over sweet and the frosting really balanced the sweetness with the dark chocolate cake. I barely got to save a piece to click a picture of the inside of the cake the next day in the natural light. Even the bits and crumbs left over on the cake stand were wiped out and gobbled by my kids. It was the best dark chocolate cake I had ever tasted. My hubby asked me to bake this cake again; 'a tiny one for us' he said :). Pre heat oven to 350°F. Grease and flour 2 8 inch round baking pans. Sift together flour, cocoa powders, baking soda, baking powder and salt in large bowl. Add eggs and sugar in a mixing bowl of the stand mixer and beat well. Now add buttermilk, coffee, oil and vanilla; beat on medium speed of mixer 2 minutes (Batter will be thin). Pour batter evenly into prepared pan. Bake 30 to 35 minutes for round pans or until wooden pick inserted in center comes out clean. Cool 10 minutes. Loosen cake from side of pan and remove from pans to wire racks. Cool completely. Sift together powdered sugar, cocoa powder and salt and keep aside. Cream the butter on stand mixture. Add the sifted sugar and cocoa powder mixture 1/4 cup at a time and mix. The mixture will initially crumble, but it will all come together with the consistency of the frosting. Now add vanilla and cream and whip on high for 30 seconds and turn off the mixture. 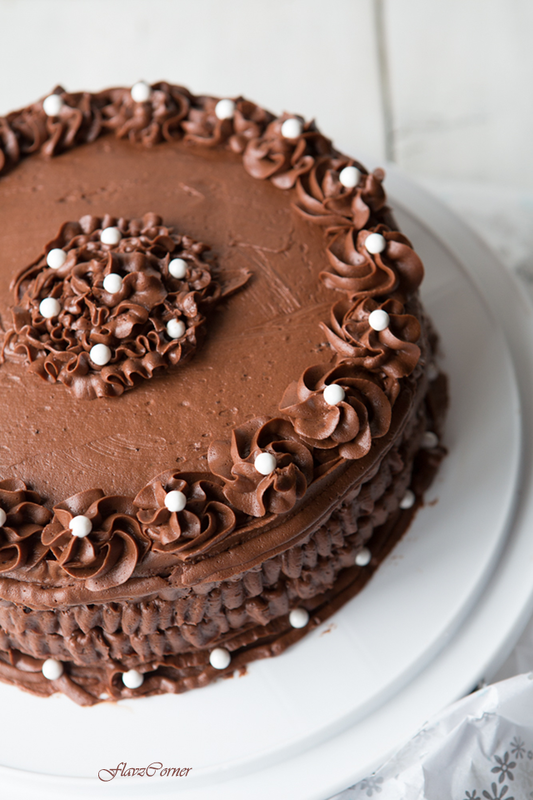 If the frosting is not used right away, keep it refrigerated. If refrigerated, keep it outside to thaw little bit so that frosting /piping can be done with ease. Cut any bulged (the cake will not bulge that much) top of the cake. Apply some frosting on the cake stand and place the first cake. Apply a dollop of frosting on the top of the cake and spread. Place the second cake and crumb coat the cake with the frosting. Then frost the cake as you desire. I used the tips Wilton 104 to make ruffles and 2D to make swirls and edible white pearls to decorate the cake. To sour milk: Use 1 tbsp. white vinegar plus milk to equal 1 cup. If you are not serving the cake the same day as you are frosting, then I recommend to refrigerate the cake. Wonderful looking cake. 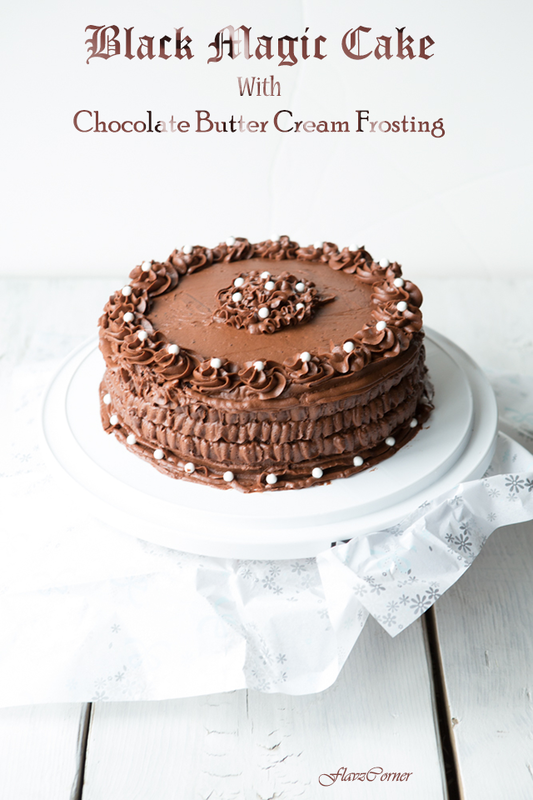 I love chocolate butter frosting and this one looks so creamy and delicious. Belated wishes to your little boy! For the sour milk: is white vinegar the normal chemical vinegar - transparent one, or is it something else? Yes, Indu, the regular vinegar (acetic acid) that we use in pickles. I sometimes dilute slightly sour yogurt and use it instead. Hope it helps. The chocolate cake looks spectacular! wow! super soft cake and congrats dear..
Congrats,Shibi...Great mile stone,wish you many more...Cake loooks super moist,am in love with the beautiful texture more than the frosting...yummmmy chocolaty,hope ur boy had a great day..Belated birthday wishes too !! congats Shibhi...2 years and 100 post is a great mile stone indeed. Love love ur cake, nice piping too, I will try this border in one of my future cake..so pretty !! Many congrats my dear. The cake looks beautiful and moist and just the kind I would love to have. Wishing you many more happy years of blogging. Wow congrats! That's so awesome! Here's to 2 years and many more! And this cake... it's totally magical!